By Nelly Lukale, SRHR Champion from YWCA of Kenya. Family planning enables women and couples to determine the timing and spacing of their children and also gives women and their children an opportunity to stay healthy. One of the most cost-effective health interventions is family planning, which can significantly improve the health of women and their children. 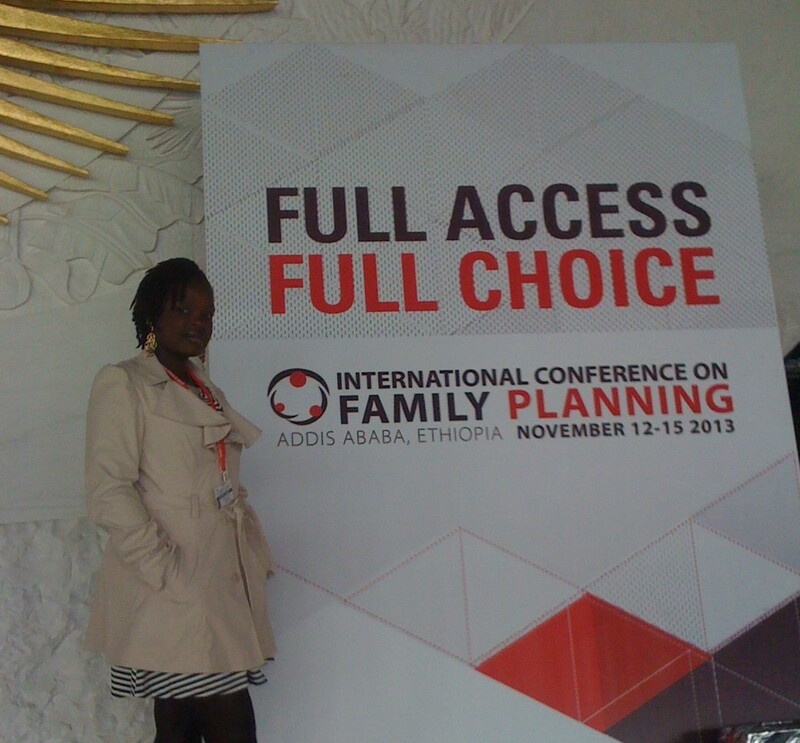 We have just concluded the third International Conference on Family Planning with the theme Full Access, Full Choice. This was one of the largest meetings focused on expanding access to contraceptives and family planning for women and girls worldwide attended by thousands of people in Addis Ababa, Ethiopia. Throughout the meeting, one intervention and solution to access to family planning information caught my attention, and that was the use of Mobile phone technology to reach out to women and girls and give them information on family planning. To me this stood out to be the most cost effective method of getting the message across since majority of women of reproductive age have access to a mobile phone. Many rural areas do not have health centers let alone well trained health providers, almost all schools do not offer sexuality education nor do they give any information on contraceptives use and if they are lucky to hear about the contraceptives or have access then they are too expensive. According to the World Health Organization, there are 222 million women who would like to delay or stop childbearing, but currently lack access to birth control. Lack of access starts with simply not having family planning services and information available. Cultural barriers still prevent women and girls from accessing family planning services and information. In some societies, using contraceptives is considered culturally unacceptable, and there is mistrust towards programmes that promote contraceptives which are in most cases opposed by the community and religious leaders. However many people (me included) have dedicated themselves to bridging the gap between this problem and a workable solution. Mobile phone usage is quickly becoming popular with as many people having access to at least a mobile phone connection. This can be the best way to get women and girls to benefit from information delivered through short messages. Through a simple sms, health providers are able to share important information on family planning methods, access, awareness and availability of services. There can also be messages designed to educate mothers on the benefits of birth spacing and reproductive health and also help them make informed choice and decisions, providing valuable information that can save lives. This low-cost approach to reaching contraceptive users has the potential of improving correct use, uptake, and continuation of selected methods. The best way is to create a special code where clients can contact the family planning providers on information by sending a specific text message on their mobile phone. From there then they can follow instructions on how to access information on the methods of their choice, including information on the location of service providers. If this method is properly used then most women will be able to learn about contraceptive methods and to be able to decide which method to use when in need and since most couples share mobile phones, these women will also be able to share these messages with their spouses. Text messaging service is perceived to be being private, convenient, and cost-effective. It is also private and confidential for users who are not willing to share the information they receive with any one and can be accessed at anytime and anywhere even at home where one can read and reflect more on the information received. It is much cheaper than having to travel all the time to the health clinics to find information. Providing family planning information via text message is a promising method of reaching women and men with health information. Even with all these technologies we still need to build and promote an enabling environment that allows women and girls to truly utilize those services and take control over their reproductive decisions. We have to engage men and boys in these discussions. Religious and community leaders also have a role to play in ensuring that while access to family planning is expanded, traditions and norms that still hinder women’s empowerment and gender equality are also being transformed. Access to contraceptives is not just about control over childbearing but about women’s empowerment and independence. Expanding access must go recognition of women as full, rights-bearing citizens with voice, power and agency. Full access and full choice can only be realised in a world where women’s other rights are also respected and protected.